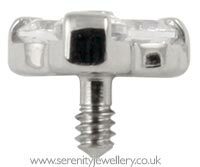 Industrial Strength* Odyssey "MÎ“Ã¾Â¼â”œâ•œnage Î“Ã¾Â¼Î“Ã»Ã† trois" hypoallergenic titanium screw-in end with three prong-set crystals. 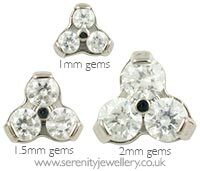 With 1mm crystals the width at the widest point is 2.75mm. 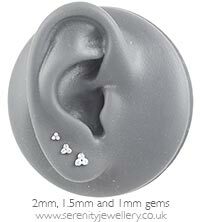 With 1.5mm crystals the width at the widest point is 3.5mm. 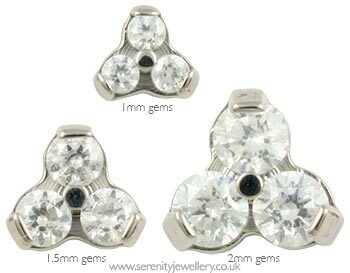 With 2mm crystals the width at the widest point is 4.75mm. Having both the medium and large size I can say that I truly love these. And i’ve got so many compliments! 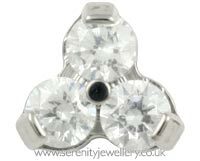 Beautiful sparkle for such a petite end, sits very comfortably against the skin. Arrived next day at no extra cost which is fabulous. IS è una garanzia, come Serenity shop! It was initially very fiddly trying to get the cluster and the post lined up. However once in, I absolutely love it. So pretty and eye catching. I have now got to get a full set! 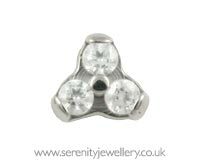 I wear this in my conch piercing and it is perfect for what I wanted, bright, feminine and dainty. Fiddly to put in, but really secure once it's in place. 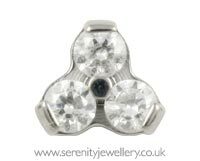 I love that with these Industrial Strength labrets I can have a jewelled end on both the front and back. I absolutely love these earrings. They are a nice size for my second ear lobe piercings and the gems are nice and bright. 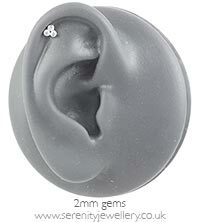 I would suggest screwing in the gem first before putting in your ear as they are tricky to grab.